Notes that the Chief Executive will confirm that a New Year’s Eve event at Trafalgar Park will not be held on 31 December 2018. 1.1 To provide additional information on the legislative obligations, sector best practice and technical requirements to enable Council to consider whether to live stream Council workshops. 1.2 To receive guidance on the content of a Council Workshop Policy, if that is to be progressed. 2.1 Council live-streams most Council and Committee Meetings that are held in the Council Chamber, but does not live-stream its workshops. 2.2 There is currently no policy on Council workshops or the live-streaming of meetings. 2.3 At 9 August 2018 Council Meeting, a Notice of Motion was presented to live-stream Council workshops. This matter was left to lie as elected members requested additional information before making a decision. 4.1 Time is regularly scheduled for Council workshops, which are held on an “as required” basis at the request of the Chief Executive. 4.2 At the meeting, it was confirmed that NZTA had advised that it had no objection to live streaming and moving forward, the Regional Transport Committee Meetings would be live-streamed. 4.3 The issue of live-streaming workshops and the impact of the Local Government Official Information and Meetings Act 1987 (the Act), what is held in public, the opportunity for free and frank discussion, sector best practice and technical matters were raised during the course of discussion on the Notice of Motion. 5.1 Under the Act, there is no requirement to live-stream any council or committee meetings. However, many councils have chosen to video their meetings and make them available contemporaneously to the public via live-streaming and, subsequent to the meeting, via a YouTube portal. 5.2 Nelson City Council originally considered the issue of live-streaming during the Council Meeting held on 27 May 2014, as part of the deliberations on the Annual Plan 2014/2015. “Councillors discussed the request for video links to Council meetings. It was noted that Mainland TV had been approached for a quote to provide video link services, but that this had not yet been received. Councillors indicated an interest in progressing video links to Council meetings, and agreed it was prudent to make a provision within the Annual Plan 2014/15 for this purpose. That provision of $15,000 be made in the Annual Plan 2014/15 to provide for video links to Council meetings if feasible. 5.4 When deciding to make funds available to live-stream, Council did not identify, either at the time or subsequently, which meetings were to be live-streamed. 5.5 However, it has become practice for all Council and the standing committee meetings to be live-streamed. To date, no workshops have been live-streamed or recorded. 5.6 The average viewing figure for the live-streamed Council Meetings are 106 per meeting. A breakdown of viewing figures per meeting is at Attachment 1 (A2041002). 5.7 Whilst the matter under consideration is whether to decide to live-stream the public workshops, it might be useful to provide some context around the status of workshops under the legislation and public access to the materials provided to elected members, as there was some discussion on this issue at the Council Meeting on 9 August 2018. 5.8 Appendix 9 to Nelson City Council Standing Orders, adopted on 22 June 2017, provides confirmation of the definition, application of standing orders, process for calling a workshop and public access. (Attachment 2 A2057046). 5.9 Under section 45 of the Act, a meeting at which no resolutions or decisions are made is specifically excluded from the application of the meeting requirements of Part 7, including public notification and public access subject only to the specified grounds for exclusion. 5.10 A workshop at which information is shared and issues and options explored, but no resolutions or decisions are made, is therefore not required to be publicly notified and Council may choose whether the public are allowed to attend or not. 5.11 At present, Council does provide public access to its open workshops; Council does not publicly notify workshops or advertise them on the Council website. 5.12 The schedule, any notes or other papers associated with a workshop are official information and may be requested under Part 2 of the Act, via a LGOIMA request. Council is required to make this material available if requested, unless there is good reason to withhold that is not outweighed by any public interest in release, in the usual way under the Act. 5.13 The matter of public access to workshops at Council was considered in the Mayor’s report of 4 May 2017. · Nelson City Council workshops had been public for some years although advertising practices varied. 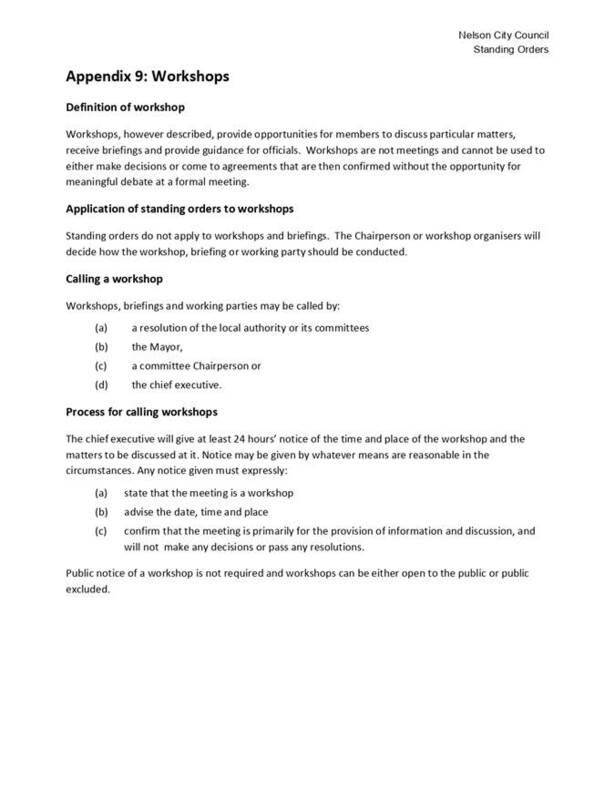 · Workshops were not public meetings as defined by the Act. · The practice was for the relevant Chair to decide whether a workshop should be open to the public, taking into account the topic and whether it was subject to negotiations, legal professional privilege, an obligation of confidence, or if the conduct of public affairs would benefit from free and frank expression of opinions. 5.15 No direction was given by the elected members on the preferred approach. 5.16 The current practice is that the Mayor (if it is a Council workshop) or the relevant Chair makes the decision as to whether the workshop is open to the public, based on advice given by staff. 5.17 Council receives multiple requests for information relating to Council workshops. The release of the schedule of workshops, any agendas, notes, presentations or other materials provided at the workshop is considered in accordance with the Act and the principle of availability, in that the information shall be made available, unless there is a good reason under the Act for withholding it. 5.18 The Notice of Motion relates to live-streaming public meetings and workshops. It is not anticipated that Council’s decision regarding the live-streaming of workshops would impact on either a Chair’s decision as to whether a particular workshop is open to the public or what information relating to the workshop can be made available to the public on request. 5.19 Council workshops are currently held in various locations. This includes the Council Chamber, other Civic House meeting rooms and off-site venues, where required. 5.20 At present, the Council Chamber is the only meeting room which has a camera and recording facilities available. The Governance Team is responsible for recording the meetings and ensuring that they are subsequently uploaded onto the Nelson City Council YouTube channel as part of their meeting duties. No additional staff are required to facilitate this. 5.21 The recent Chamber IT upgrade improved the quality of the audio available. The camera captures elected members during meetings, though it has no functionality in respect of viewing any information displayed on the two screens. 5.22.1 The quality of the live-streaming needs to be of an appropriate standard, regardless of location. 5.22.2 The quality of video for alternative venues may be compromised as there is no facility to record in other Civic House meeting rooms or off-site. 5.22.3 Alternative venues to the Council Chamber will require additional resources in terms of recording equipment and staff to operate it. 5.22.4 Workshops frequently make extensive use of audio-visual materials, such as PowerPoint presentations, videos and handouts. Current equipment would not be able to make this accessible to viewers, potentially leading to reduced public viewer experience. 5.22.5 Additional investment in IT equipment, such as a second camera or projector for the Chamber to capture the supporting material and video recording equipment for alternative venues may be required. 5.22.6 There will be additional costs associated with the installation and maintenance of an enhanced system. 5.22.7 There will be additional staff costs - if more than one camera or source is used for the video feed, staff would be required to manage the switch between sources during the live-streaming of the workshop. Staff would also be required to record workshops held at alternative venues. 5.23.3 Website Review – Council websites have been viewed to ascertain what information is publicly available in respect of workshops, including, but not limited to advertising workshops on their website, the availability of workshop schedules, agendas, presentations and other materials, any comments relating to live- streaming and recording options and whether there is open public access to workshops. The Governance Team has contacted the councils directly to confirm the information. 5.23.4 ListServ Request – Governance professionals voluntarily subscribe to the Governance and Committee Advisor ListServ through the Society of Local Government Managers (SOLGM). Nelson City Council emailed all subscribed SOLGM Governance and Committee Advisors and asked for feedback on how they managed their workshops. 5.24 All eight councils that responded to the ListServ request confirmed that they never have public workshops. 5.26.2 Agencies get some information and advice, but it is not as open, honest or complete as it could be, making it harder for them to do their jobs and make good decisions. 5.28 Staff, therefore, do not support the live streaming of all workshops. The development of a Council Workshop Policy would provide clarity for members of the public, the organisation, the media and elected members, ensuring a comprehensive and consistent approach on all matters relating to workshops. 6.1 The options are set out below. Council Officers recommend Option 1. 7.1 Council has increased access to the information provided to elected members as part of the decision making process through making workshops open to the public. Council officers consider that the development of a Council Workshop Policy, with input from elected members, would provide clarity to the public, the organisation and elected members and ensure that a consistent approach is taken regarding all matters relating to workshops. Accessibility by the public to information made available to elected members as part of their decision making supports the openness and transparency required to engage the public to enable democratic local decision-making and action by, and on behalf of, communities. There is a risk that members of the public are dissatisfied that clarity on all aspects of Council Workshops will be deferred until the Council Workshop Policy has been adopted. While matters concerning public access to the information provided to elected members as part of their decision making generally raise a high level of public interest, it is considered that the decision whether to live-stream meetings and make other workshop materials available are of low significance in terms of the Council’s Significance and Engagement Policy. 1.1 To provide Council with information on the ‘Bay Dreams’ music festival. 1.2 To decide whether to conditionally approve, as landowner, a request for camping at Rutherford Park and Saxton Field from 3 to 5 January 2019. 1.3 To advise Council that a New Year’s Eve event will not be held at Trafalgar Park on 31 Dec 2018 when ‘Bay Dreams’ operates. 2.1 Bay Dreams is an R18 music festival at Trafalgar Park on 4 January 2019 with international dance and dub acts including a headline act of ‘Cardi B’, a major American artist. The event is sold out with 20,000 tickets pre-sold. Pre-party (3 January) and after-party (4 January) events are also scheduled at the Trafalgar Centre. The promoter has applied to host 1500 campers at Rutherford Park and up to 5000 campers at Saxton Field, and also asked that no New Year’s Eve events be held immediately prior to ‘Bay Dreams’. Consents are still being applied for. 4.1 ‘Bay Dreams’ is a sold out one day music festival attracting 20,000 young people to Trafalgar Park to hear national and international dub and dance acts on 4 January 2019. The headline Act is ‘Cardi B,’ a major American rapper with a very large international following. Pre-party and after party events are scheduled at the Trafalgar Centre. The promoter is seeking to establish Bay Dreams as an annual event if successful. 4.2 The Bay Dreams South company has been recently established by experienced event promoters who have successfully delivered large scale concerts and festivals in New Zealand for 16 years. The parent and associated companies deliver over 300 events across NZ annually. The partners of the company are Pato Alvarez, Mitch Lowe, Toby Burrows and Good Times NZ Ltd. Toby Burrows is the Festival Director. 4.3 The event has been far more successful in its ticket sales than anticipated by Bay Dreams South. 17,500 tickets have been purchased from outside the Nelson/Tasman region, although a proportion of these are likely to be local people returning home for the event, such as students. The promoter has applied to host 1,500 campers at Rutherford Park and up to 5,000 campers at Saxton Field between 3 and 5 January. On site camping will provide accommodation options, but has associated risks of nuisance, disorder and intoxication. Commercial accommodation has very limited extra capacity at this time of year. 4.4 Bay Dreams South has received 1,600 booking requests for camping to date, and an additional 2,000 ticketholders have indicated they do not have accommodation organised. Planning is therefore proceeding on the basis of gaining permission for camping to accommodate up to 6,500 people (1,500 at Rutherford Park and 5,000 at Saxton Field), although Bay Dreams South believes actual demand may be less. By comparison, the Tauranga ‘Bay Dreams’ event tickets 30,000 people with 5,000 campers and the Gisborne ‘Rhythm and Vines’ hosts 20,000 with 12,500 campers. 4.5 A range of Council compliance obligations must be met in order for ‘Bay Dreams’ to be held. Building consents are required for marquees and staging, noise consents for Trafalgar Park and the Trafalgar Centre, traffic management plans for CBD road closures, a resource consent for camping at Saxton Field (if required), and special alcohol licenses for all venues. 4.6 Bay Dreams South has asked Council to not agree to a Trafalgar Park New Year’s Eve being held three days before the ‘Bay Dreams’ festival. This is because a noise consent may not be approved if there is potential for another festival in the days immediately prior. This is supported by officers and the Chief Executive (CE) would provide a letter confirming that no competing New Year’s Eve events will be held at Trafalgar Park on 31 December 2018. 4.7.1 The event has exceeded all expectations and is at capacity with 20,000 tickets sold and a waiting list of 2000. 17,500 tickets were purchased from out of town (although some are likely to be local people returning for the event). 4.7.2 Transport to and from Saxton Field can be addressed. Bay Dreams South will bring in additional buses and drivers from Christchurch if required. 4.7.3 A pre-party (3 January) and after party (5 January until 3 am) are planned indoors at the Trafalgar Centre. 4.7.4 Work on consent applications is underway, but time is very tight. 4.7.5 On-licence alcohol sales are planned for festival and camping venues to avoid uncontrolled BYO or pre-loading. ‘Red Frogs’ (a trained welfare service to assist party goers) and St John will provide support services. 4.7.6 Protective matting will be needed for turf protection at Trafalgar Park. The expectation is that turf protection will be funded by Bay Dreams South, and any damage to the turf will be its responsibility. 4.7.7 Alcohol, consents and security functions have been contracted to specialist providers, all of whom are said by Bay Dreams South to have had significant large event management experience. 4.7.8 Bay Dreams South will supply and fund all services such as security, transport, ablutions and welfare at the venues and campgrounds. Council is responsible for ensuring the plan meets requirements and for monitoring. 5.1.1 Bay Dreams will be of significant impact for Nelson. It is the largest music festival ever hosted in Nelson and will result in an influx of visitors. The promoter is highly experienced having delivered similar events over many years in Tauranga and Gisborne and intends to build a long term presence in Nelson. 5.1.2 Initial expectations were that ticket sales would be between 8,000 and up to 15,000 if demand was very high. Actual sales of almost 20,000 and a waiting list of 2000 have exceeded all expectations and created additional pressures for accommodation and services. 5.1.3 Nelson Regional Development Agency (NRDA) has offered to provide some comment on the economic benefit of the event. A large additional visitor contingent will have significant economic benefits for retail, hospitality, entertainment and other services in the City. Economic and cultural benefits will be long term as the promoter intends delivering this and other concerts, such as UB40, on an ongoing basis to Nelson. 5.1.4 Negotiations are under way with Bay Dreams South regarding fees for Trafalgar Park, Trafalgar Centre, Rutherford Park and Saxton Field with a view to recovering costs. These fees will take account of the increased size and scope of the event. Bay Dreams South is not seeking a Council financial contribution towards delivery of the festival. 5.1.5 A festival of this nature does create risk. Similar events in Gisborne and Tauranga have resulted in disorder. Some residents will be affected by noise and an influx of partygoers will put Police and health services under strain. City infrastructure will be under pressure, particularly accommodation and transport and there is a risk of damage to the Trafalgar Park surface. These risks have been discussed with Bay Dreams South and risk management processes are being developed. 5.1.6 Officers have developed a project plan to ensure that Council activities are co-ordinated and milestones are achieved. 5.2.1 At this stage, Council are asked to conditionally approve camping at Rutherford Park and Saxton Field. This will allow the organisers to accept bookings and provide a detailed plan to Council for final approval. 5.2.2 This decision relates to ‘landowner’ permission for camping at Saxton Field. It is noted that camping at Saxton Field may still require a resource consent. Other consents (as per para 4.5 above) are also required. 5.2.3 Council will not be required to provide or organise services within the venues or transport to and from the campground as this will be organised and funded by Bay Dreams South. Council will need to agree to an acceptable plan around these arrangements. 5.3.2 Saxton Field Management Plan: A resource consent for camping at Saxton Field may be required if this is deemed to not be a permitted activity under the Saxton Field Management Plan. Legal advice is being obtained to confirm this position. 5.3.3 Freedom Camping Legislation: Camping is not permitted outside a registered campground, unless permission from the CE is granted. 5.3.4 Camping Regulations: These regulations apply to registered campgrounds only – not temporary campsites. This legislation will be useful as a reference document however as it defines minimum campground standards. 5.4.1 The demand for campsites is estimated to be between 3500 and 6000 people. As noted above, 1500 people have booked for Rutherford Park and there are an additional 2000 people who indicated they have not yet organised accommodation. 5.4.2 Bay Dreams South has requested permission to use Rutherford Park for camping for 1500 campers and view camping at Rutherford Park as important to the festival’s success. Noise emission is possibly the largest risk with this site. An acoustic assessment undertaken by Malcolm Hunt Associates as part of Bay Dreams South’s consent application states that any noise issues associated with camping can be controlled so that noise emissions will comply with the Nelson Resource Management Plan (NRMP) limits applying to the site. 5.4.3 Saxton Field is preferred as the second site over other options, such as Neale Park, due to its size and distance from residential neighbours. The main downside of Saxton Field is the need to provide a shuttle bus service between Trafalgar Park and Saxton Field. Bay Dreams South advises that bus transport can be organised to move the large number of campers (potentially up to 5,000) between Trafalgar Park and Saxton Field. This may require bringing in additional buses and drivers from outside the region. 5.4.4 The Saxton Field campground would be located away from the residential boundaries of Saxton Field, and set apart from Saxton Oval. The central third of Saxton Field would house tents, with the showers and toilets in the surrounding facilities utilised as much as possible. Car parking for the campground would be provided on the undeveloped land adjacent to Saxton Oval. 5.4.5 It would be Bay Dreams South’s responsibility to provide these services – Council and other agencies would ensure that the agreed conditions are met. The provision of camping at Saxton Field would be discussed with the Tasman District Council and the Saxton Field Committee will be informed. Nelson Cricket have also been advised. 5.4.6 Bay Dreams South proposes that all campsites are licensed. This helps to contain drinking activity in an area that can be supervised by the event organisers and reduce pre-loading. 5.4.7 Final approval for camping would only be granted on receipt of an acceptable plan. Bay Dreams South would also be required to pay a deposit to cover any damage. 5.4.8 While Bay Dreams South is agreeable to applying for a resource consent for Saxton Field, it has indicated that if public notification is required it would not be feasible for 2019. 5.5.2 Neale and Guppy Parks: While within walking distance to the venues, these not favoured by organisers or officers due to close proximity to residents and a likely need for a notified resource consent. Bay Dreams South may utilise Neale Park as a car park instead. 5.5.3 Commercial Campgrounds - The Brook, Tahunanui, Maitai Valley: While some capacity is available there is insufficient capacity to host large numbers for this event. Some overflow camping is being investigated for the Maitai Valley campground. 5.5.4 A&P Park, Richmond: Potential clash with Summer Racing programme. Would also require shuttle transport over a longer distance. 5.5.5 Do nothing: Not recommended as 5000+ concert goers will be dispersed with risks of uncontrolled freedom camping. Potential safety issues for campers, uncontrolled intoxication and nuisance to residents. 5.6.1 Not all residents will welcome the noise and partying associated with this type of activity and some complaints are to be expected, regardless of location, even if the camping is relatively incident free. Apart from distancing noisy activities from residents, options to reduce generalised noise are limited. · Maintain minimum standards consistent with the Camping Regulations around egress, ablutions, safety and hygiene. · Provide continuous public access to the Maitai River walkway. · Have an agreed parking, rubbish, Saxton Oval protection, water and waste water plan. · Be fully fenced with an approved security plan. Only paying campers 18+ would be admitted and no tolerance for anti-social behaviour. First aid and personal support services would be available. · Be drug and alcohol free apart form an approved licensed area. · Have an agreed transport plan for shuttles and parking. · Comply with other conditions following advice from Police, Public Health, Fire and Emergency NZ and other agencies as required. 5.8.1 Environmental Inspections Ltd (EIL): EIL confirmed the importance that alcohol controls are enforced, there is a strong security presence, controlled entry and effective management of the sites to mitigate risks. 5.8.2 Police: While a campground of concert goers is not ideal, it is preferable to have them at Rutherford Park or Saxton Field in a controlled environment rather than freedom camping. Police were concerned about rioting in Gisborne in 2015, and a near riot at Tauranga in 2018. A high security presence by event organisers is essential, as Police will not have resources to provide security for the event. Despite this, the promoter appears credible, experienced, well organised and has good risk mitigation plans. Police prefer an on licence with tightly controlled bars in preference to a total alcohol ban, which introduces risks around uncontrolled pre-loading outside the gate. 5.8.3 NMDHB Public Health: Public Health endorses the Police perspective. 5.9.1 The promoter is concerned that the existing Council-held noise consent permits a New Year’s Eve event to be run at Trafalgar Park. Bay Dreams South seeks to modify the Council consent as provision for two major festivals at the Park in the same week could compromise its noise consent application. 5.9.2 No New Year’s Eve events have been held at Trafalgar Park since 2008, and there are no plans to do so in the foreseeable future as New Year’s Eve festivities are now CBD focused. 5.9.3 The CE will provide written confirmation, under his delegation, that no New Year’s Eve events will be approved at Trafalgar Park in 2019, and will also undertake to consider the implications of modifying the Council held noise consent for future ‘Bay Dreams’ events. · Project coordination costs. Backfilling and contracting out of essential existing business tasks for Council project coordinators: $45,000. 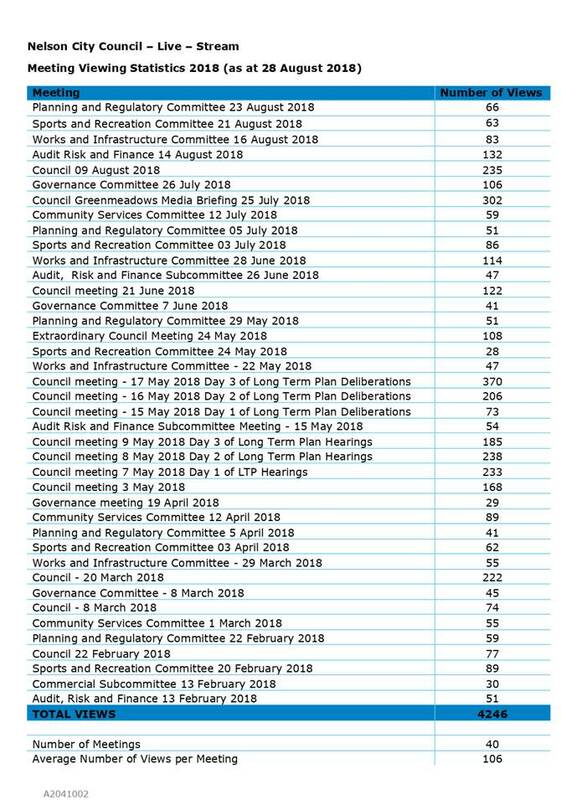 · Council staff time on public holidays: $3,000. · Public communications to Nelson residents: $10,000. · Street clean up outside of venues: $3,000. · Hire of protective matting at Trafalgar Park. · Remediation of any damage to park facilities or surfaces. · Venue security, shuttles, welfare, ablutions, infrastructure and related services at Saxton Field and Trafalgar Park. · Venue management by CLM and Nelmac. 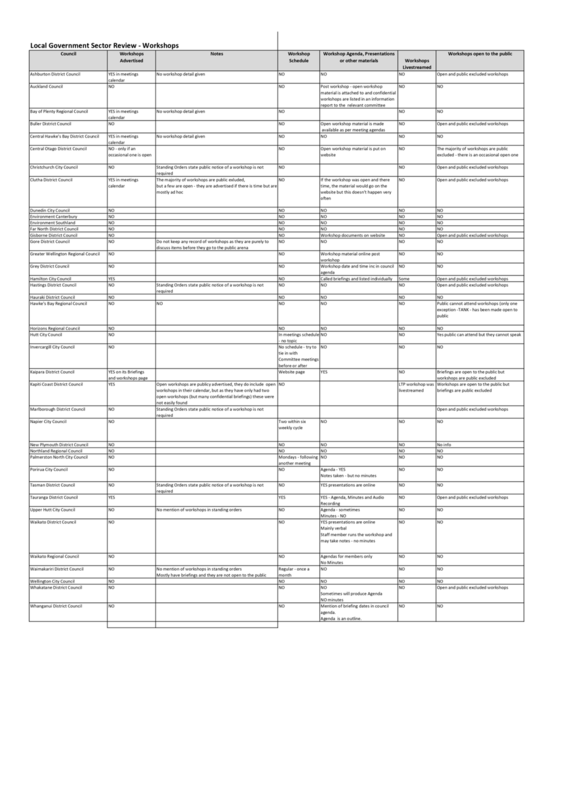 · Planning and support tasks by Council officers. 5.11.1 At an overall level, the Council’s objective in hosting events of this type is to enable added economic, social and reputational advantage to Nelson, while ensuring that the community’s facilities are not damaged and public order is maintained. · Insufficient accommodation for festival goers leading to freedom camping, associated public disorder and exposure of festival attendees to harm. · Damage to Council facilities including the Trafalgar Park turf and other spaces allocated to the event as a result of the large numbers of attendees and the festival activities or adverse weather conditions. · Noise and nuisance from festival events to local residents. · Influx of large numbers of people disrupting normal community activities and those of other holidaymakers. · Social disorder and associated alcohol related harm. · Council consents not being approved, or requiring public notification. · Reputational damage to Council if the festival does not proceed or run smoothly. · Application of the event operator’s existing expertise and experience. · Bay Dreams South engaging professional planners to assist with consent applications. · A desire by Bay Dreams South to run future events of this nature over the short and long term and to build a partnership with Council. · Preparations already started by police, emergency service providers and key partners. · Obligations placed on the event operator through the existing venue booking arrangements and consent process. · The use of Rutherford Park and a section of Saxton Field as a festival managed camping location will provide controlled accommodation for attendees while minimising disruption and effects on the community and other holidaymakers. · Further specification within the venue hire agreements, including detailed plans to be approved by the Council, and the proposed addition of a bond to be available to rectify any damage to hired venues, will reduce the impact of any damage to Council facilities. · Allocation of Council staff and resources to monitor that agreed preparations are put in place and executed as planned, will help ensure that the event is well controlled and successful. · The provision of a comprehensive event management plan for approval and monitoring by Council officers. · Possible injury to one or more festival goers: Risk level medium on the Council scale. · A small amount of damage to Council facilities: Risk level low on the Council scale. · Possible minor environmental damage from festival goer activities: Risk level low on the Council scale. · Local or national level criticism possible if disruptive behaviour or injuries attract press or large social media attention: Risk level medium on the Council scale. · Unplanned unavailability of Council facilities to the Nelson Community: Risk level medium on the Council scale. Assuming the event proceeds, a debrief with the promoter and local agencies will be held at the conclusion, to ensure that any lessons are taken on board before any decision is made for any subsequent ‘Bay Dreams’ events in Nelson. 6.1 Rutherford Park and Saxton Field Camping: Option 1 is recommended. Option 1: Conditionally approve the application for Rutherford Park and Saxton Field Camping. · Camping is an intrinsic part of this large event. Patrons, event organisers and visitors will be satisfied. · Attracts visitors and associated economic benefits. Rutherford Park camping will support increased CBD patronage. · Supports event viability over the longer term. · Allows Council and agencies a degree of control over camping and behaviour. · Will enhance Nelson’s reputation if it goes well. · Some disruption to local residents. · Large scale shuttle transport will be needed for Saxton Field. Buses and drivers from further afield will be needed. · Risk of disorder if patrons are waiting after the event for shuttles to return to the campground. · Potential risks of disorder associated with intoxication in the campground. Option 2: Decline Saxton Field Camping Application. · May mitigate some risk of a concentrated gathering of partygoers. · Freedom camping – patrons will sleep and camp anywhere they can. · Isolated, vulnerable young people at increased risk of harm. · Alternative sites all have size limitations or close proximity to local residents. · Reputational risk as Council could be criticised as unwelcoming of major events or activities for younger people. 7.1 In order to provide camping facilities for ‘Bay Dreams’ Council is asked, in its capacity as landowner, to conditionally approve a request for temporary campgrounds at Rutherford Park and Saxton Field. The ‘Bay Dreams’ festival provides entertainment services and economic benefits to Nelson City. · Our communities have opportunities to celebrate and explore their heritage, identity and creativity. · Our communities have access to a range of social, educational and recreational facilities and activities. · Public disorder: Medium likelihood, high impact: mitigation involves effective planning, monitoring and enforcement activities and agency partnerships. · Reputational: Medium likelihood, high impact: 20,000 young people have purchased Bay Dreams tickets to see international acts. If the festival were not to proceed and Council were blamed, there would be reputational damage to Council. · Damage to Council facilities (eg, Trafalgar Park Turf): high likelihood of minor damage, low likelihood of major damage: the agreement with Bay Dreams South will include bond, indemnity, requirements to ‘make good’ facilities, and protection for the turf. · Consents: Medium likelihood, high impact: organisers cannot proceed if required consents are not granted. · Legal: Low likelihood, medium impact: organisers stand to lose a significant amount of money if the event was not Council permitted. It is considered that, with the arrangements being put in place, risks can be managed to an acceptable level. While Bay Dreams South is not asking for direct ratepayer funding, there is a significant staff time component associated with planning for and monitoring this large scale event. The direct costs to Council are estimated to be $80,000 of unbudgeted expenditure. Economic benefits to Nelson have not yet been quantified but are anticipated to be considerable for this and future events of this scale. This matter is of medium significance because it will negatively affect a small proportion of residents close to the venues. Therefore engagement will occur in the form of the event promoter communicating directly with local residents and taking measures to minimise noise and nuisance. This decision is referred to Council as it relates to the delegated authority of several committees including Sports and Recreation Committee and the Governance Committee, and to address timeliness issues.